Arriving to Bergen by cruise ship? Don’t miss Mount Fløyen! The stunning view of Bergen from Mount Fløyen will take your breath away! Here you will find information about shuttle buses, directions and how much time you should estimate to get to Fløibanen funicular from your cruise ships mooring! Cruise passengers arriving at Jekteviken or Dokken areas estimate 20 – 25 minutes walk to Mt. Fløyen and the Funicular. Cruise Passengers arriving at Skolten, Festningskai or Bontelabo areas estimate 10 – 12 minutes walk to Mt. Fløyen and the Funicular. If you want to walk back to the city center from Mr. Fløyen estimate 45 minutes, it is 3 km. The funicular is well suited for wheelchairs and trollies/prams. There are lifts both at the lower station and the upper station. Mount Fløyen serves up a unique view of Bergen. From the specially made view-point, with railings and ample opportunities to enjoy the view, you can see as far as the islands outside of Bergen, the fjords and the North Sea. At the same time, you can localize famous buildings of Bergen, like Bryggen, the fortress Bergenhus festning, the concert hall Grieghallen, and all of the parks and tiny houses scattered along the seven mountain tops. 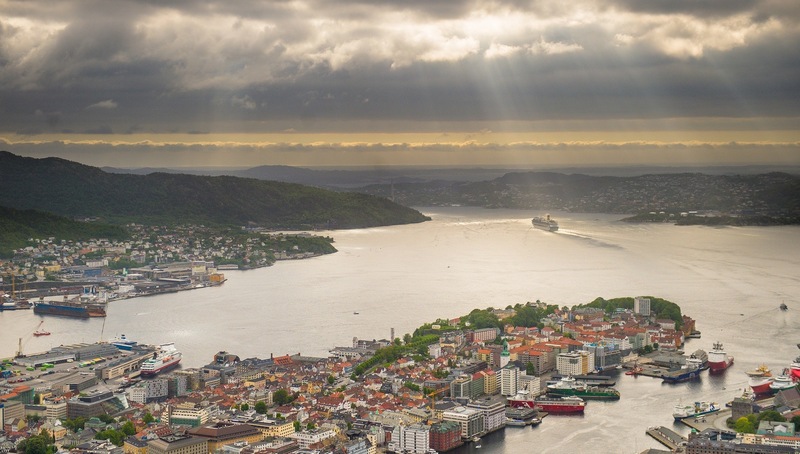 The view is something very special, and you haven’t really seen Bergen from its best side if you haven’t taken in the breathtaking view from Mount Fløyen. Fløibanen Funicular is open every day, 365 days a year. Check updated opening hours. Some cruise ships will provide tickets as you travel, but you are free to book your ticket in advance. Already having a ticket will secure you a spot, as Fløibanen Funicular actually has a maximum capacity per day. You will be able to pass the line buying Fløibane tickets from the ticket office, and go straight to the line for prebooked tickets. During the summer season, the queue might be long and look daunting, but don’t despair. The queue moves quickly and we will have you gazing in awe at the top of Mount Fløyen in no time! Buy tickets for Fløibanen Funicular online. From 2016, Port of Bergen has changed the shuttle route for cruise passengers arriving in the Jekteviken and Dokken areas. Passengers arriving here will now be transported by shuttle bus to the back of the parking garage at Hurtigruteterminalen (speed boat terminal). From this stage we have marked the road from Nøstetorget to the town centre (Den Blå Steinen – The Blue Stone) with white painted arrows and dots. Walking distance is about 600 metres. From this point, it will take you another ten minutes to get to the Fløibanen Funicular. Passengers who need wheelchairs, and make use of the HC-minibus, will be driven directly to the city centre (Den Blå Steinen – The Blue Stone) and get picked up the same place for the return. From these ports it will take you approximately ten minutes to walk directly to the Fløibanen Funicular. There are no shuttle buses to the town centre, just follow the sidewalk all the way along the harbor and the famous Bryggen, and you will find Fløibanen at Vetrelidsallmenningen. Download map of Bergen with attractions and mooring for cruise ships. Buy one more Cruise Pass Experience and get discount and special offers on your complete Norway Cruise. The Cruise Pass is a new discount-benefits card, tailor made for the independent cruise tourist. 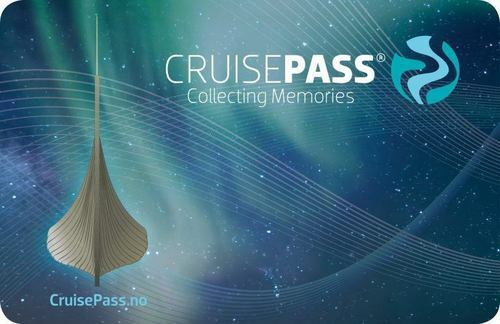 The Cruise Pass will not compete with onboard shore excursions, but provides a supplementary service to tourists visiting multiple ports and cities in Norway. Buy the card here: Onboard your cruise ship or online at CruisePass.no. Read more about where to use your Cruise Pass.